This year's Summer has been one of the hottest. for your dates, parties, shopping sprees, luncheons and gatherings! Here are some items that we recommend for the season! Here is our METAMETABALL stainless steel pendant & chain set. and I tried pairing it with our BLOBB Sterling Silver ring. and they make a wonderful company for your summer outfit! Our DRAGONFLY pendant is another highly recommended item. It is lightweight and 'feathery', a spirit-lifting item! ROOP is a smart and stylish item to jazz up your dress for a dinner date or party! Our BROOCHES are something you have to take a look too! 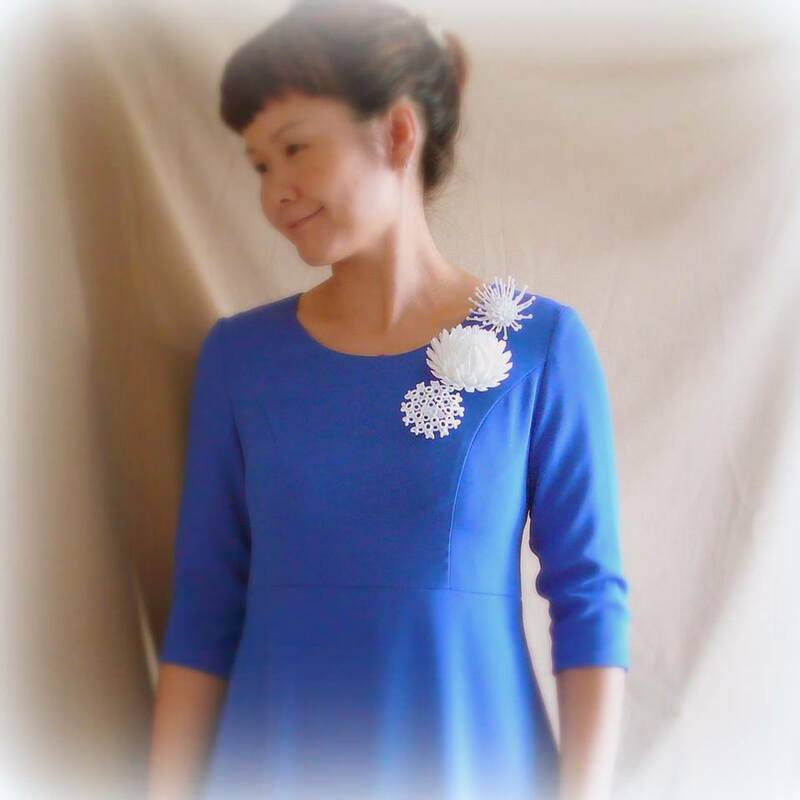 MIMOSA, KIKU and WHIP are some of our very popular brooches. And they make you HAPPY! Here I tried on the pieces with one of my very first dresses in Royal Blue! It has been a refreshing experience putting on the variety of accessories. We hope you will enjoy mixing and matching MONOCIRCUS' items with your favorite outfits! Look great and have lots of wonderful memories this Summer with MONOCIRCUS! 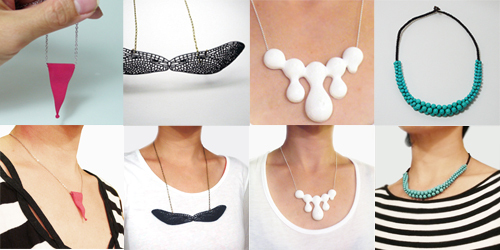 Our 3D printed ORIGINAL pendants have just been Restocked! composed of a wire structure of our original METABALL series of dripping beads. Unique and stylish and totally CHIC! FURYL, one of the rare series of GOLD PLATED pendants we made. This pendant is 3D printed in gold plated stainless steel. Inspired by folded fabrics and frilled collars of historical victorian costumes. The pendant comes with a very nice black and gold plated chain. RIBBON is an intriguing pendant that emphasize the intertwining strip of a bow. it comes with a beautiful black and gold plated chain. Click on the image above to check them out or click on the names of the items above! We have just released our April Newsletter. plus a new and original Kids' T-shirt! Check out the newsletter by clicking here! 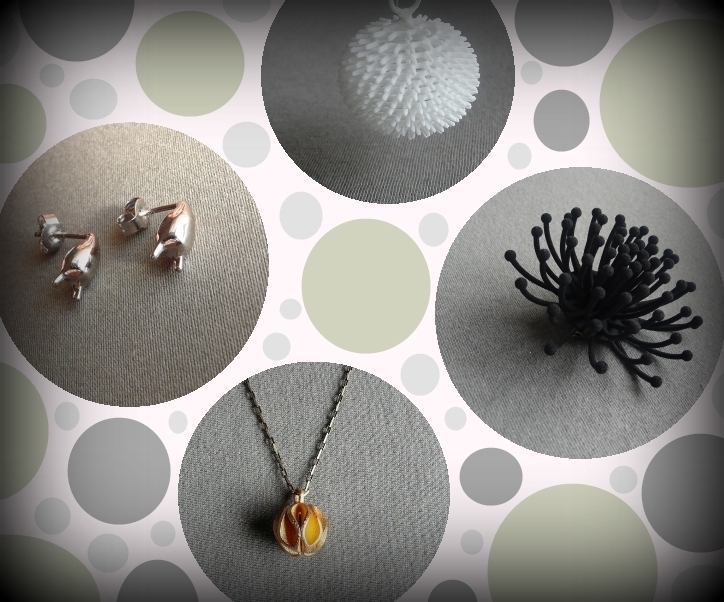 and you also MUST see more about the lovely new items shown here by clicking on the above images! we have just sent out our February newsletter, featuring our latest items. this month, we have just a few little new arrivals and a few pretty good news about monocircus. click on the image above to see our newsletter! and if you have not yet gotten registered with our monthly newsletter, we hope you will now... at the link below! and do drop us a line any time at [email protected] with your enquiries or comments. Recommending our original Metametaball stainless steel pendant and chain. This item is a development from our metaball series which has become one of Monocircus' signature designs. Metametaball is fabricated by a professional jewelry maker who has been our trusted partner for their high quality and intricacy. This item though made in stainless steel, is beautifully polished so each piece look just as great if not prettier than silver. And being stainless steel, there is no worries about the color changing. The pendant is created such that it is hollow on the inside, so it is light in weight. The bead chain is only 2mm in thickness so it looks very intricate and elegant. feel free to send us an email or leave a comment when you place your order. We will be able to custom make the chain to your desired length. A versatile item that goes with a variety of occasions, casual or formal. this sterling silver pendant and chain set is something we came up with and designed. 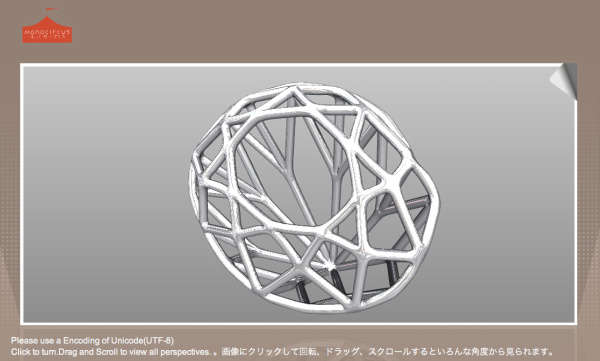 its 3 dimensional modelling data was sent to a professional jewelry maker to fabricate. and one that can be worn in various ways. below shows just two of the ways you could wear this item. through its middle such that it looks like it is hanging midway. this pendant and chain set comes with a choice of two types of chains. longish or short. the pictures here show the short version. the pendant is relatively big as compared to the typical silver charms you often see. but its delicate linework makes it sophisticated and elegant. Today I took the kids out on a drive to town to run some errands. and just for the fun of it, I wore a sample piece of the white metaball necklace. Didn't have the time to properly coordinate what I wore but I was wearing a dark navy blue outfit with black and white sneakers. Putting on the necklace somehow made me feel happy. The metaball necklace is lightweight so it is easy on the neck. It is a fun piece that goes great with both casual and smart casual outfits. Highly recommended for this Summer! Made in etched plastic. They are lightweight, easy to put on and very pretty! The unique drawings finely and firmly printed on the plastic pendant base are created in a nostalgic vintage style that is outstanding yet not overly elaborate. They are great and chic to wear with outfits in variable styles. Monocircus provides free gift wrapping service. Just leave us a message upon checking out your purchase and we will do it all nicely for you with an added little card. Click on the picture above and it will bring you to our online catalog. You can now view our DIA necklace in 3D! Click on the image below or go to our DIA necklace catalog page and see its details. It will lead you to a page just like the one shown here. All you need to do is to drag on the image or scroll and you will be able to view it up close in all angles and scale! and when you click the image once, it will begin its automated rotation view. Play around with it and experience the 3D model. Here's presenting our latest creations that should not be missed! They make lovely gifts for mothers, wives, friends, partners or for yourselves! Polished stainless steel pendant with stainless steel bead chain. that is one of Monocircus' signature items. Also one of our personal favorite items! We have this item in BLACK. Now we have got it in brilliant WHITE! So fine are its details... it looks like lace! Very pretty! You cannot miss this! and had them fabricated bya professional 3D printing agent in Holland. It is made in white strong and flexible plastic. Very delicate and very lightweight too! For more details, click on the images of the individual items above and it will take you to our store catalog.